Turlututu! Where are you? Are you here? Here are you! It is you! You are Turlututu! Turlututu is nowhere to be found. He fell from the book and disappeared. But, how is he to be found, when he can be smaller than a flea or higher than a church tower? How is he to be looked for, if it takes him only an instant to change his colour, fly away to space or simply vanish by just uttering the right magic words? How? Quite easy, actually. Let's all be Turlututu! And, let's catch him! 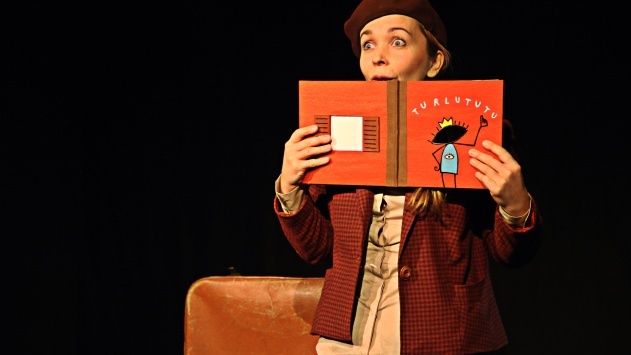 This puppet miniature-in-a-suitcase is based on a puppet adventure of Turlututu – a character that has been developed for many years by the renowned French illustrator and author Hervé Tullet. Turlututu is lively, dynamic, roguish, amicable, inventive and full of new ideas. In the book, this ideas read by turning the book (the character falls on the right), by pressing the button (on the following page the light turns off, by blowing (all the unwanted is gone on the next page of the book), etc. In the puppet performance, the character from the book slips out to the stage and immediately gets lost. While looking for him, the viewers find themselves in Turlututu's imaginary world, where the magic theatre things start unrolling in front of him. By blowing, applauding, closing their eyes, reviving the objects as well as by delving into their intuitive ingenuity and responsiveness, children become active actors of the play, in which through directing, interpretative and technical ideas puppetry is brought to life in all its dimensions. The Little Turlututu comes to life on stage almost speechlessly, with a bit of scenery and an abundance of play and imagination. It is exactly why he stays with his viewers even after the performance. And where actually is Turlututu? Everywhere! He is out there and he is exactly what we imagined! Before you see the performance, leaf through the picture book Turlututu. Discuss the course of performance. Have you noticed that instead of pronouncing her texts, the performer rather produces some subtle sounds or words? How did Turlututu look like? Oh, or rather, how did you imagine him, since he was invisible? The viewers were invited to join the performer on the stage. We call it “an interactive performance”. What was your experience of this particular kind of contact with the performer? Make up your own story about an invisible creature or object and try to perform it together. Turlututu takes the toddlers to the world of fantasy by constantly adjusting itself to their perception, understanding, emotional experience and expression, as well as to their social capacities. It is mostly a game of search, speculation, repetition, questioning and imagination, which not only amuses the children, but also engages them to participate. The play boasts enough dynamics and sparkling ideas to reach the little viewers’ interest and expectations as well as to successfully maintain them until its end.